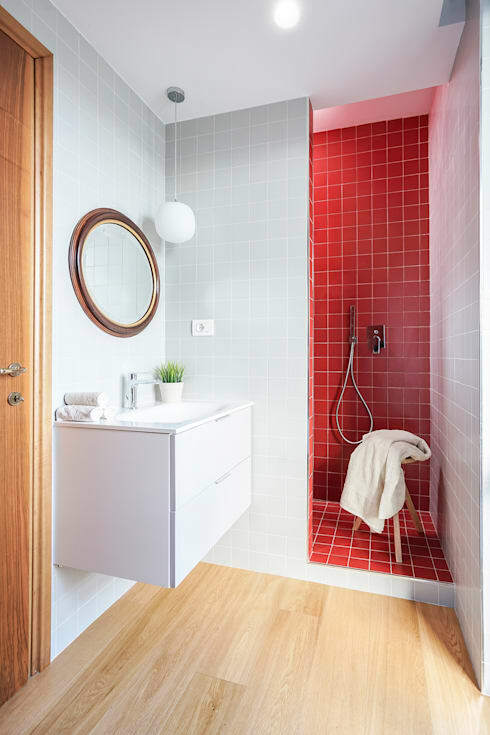 A wall with vermilion tiles stands like a block of colour in this small bathroom. The square footage here is the last thing to be noticed, due to the impact that the vibrant hue has on the eye of the beholder. The Mediterranean aesthetic exerts considerable influence on contemporary interior design. This bathroom is packed with colours and motifs inspired by the sea, and sleek, chic glass panels bring a contemporary finish. Undoubtedly an environment that surrounds us with relaxing vibes. 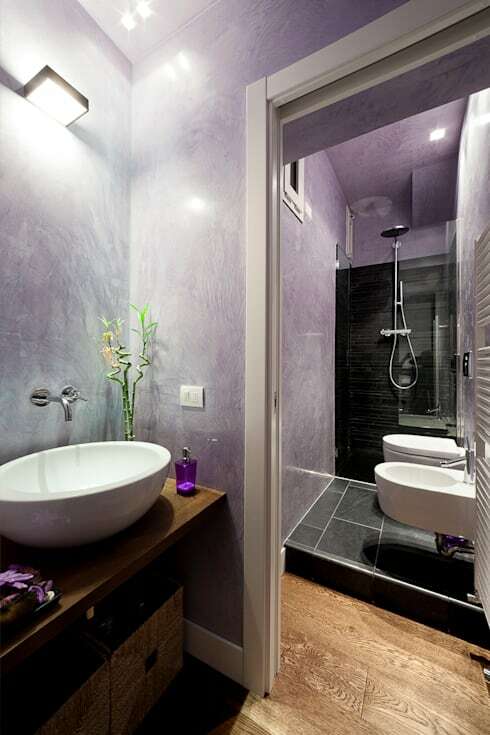 This next bathroom is small but well-kept in every detail, with a modern yet classic ambience at its heart. The grey wall colour alternates with graphic pop patterns in this unique space. 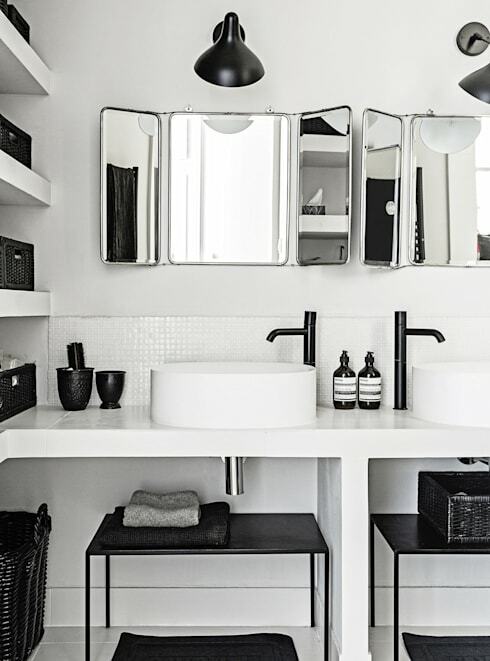 A Nordic touch and some retro inspiration is never a bad thing, however tiny your space. The next example welcomes us with pastel colours ideal for small sizes, suspended cabinets and motifs from the 1960s. And last but not least, the coordinated freestanding bath that exploits the corner of the attic. 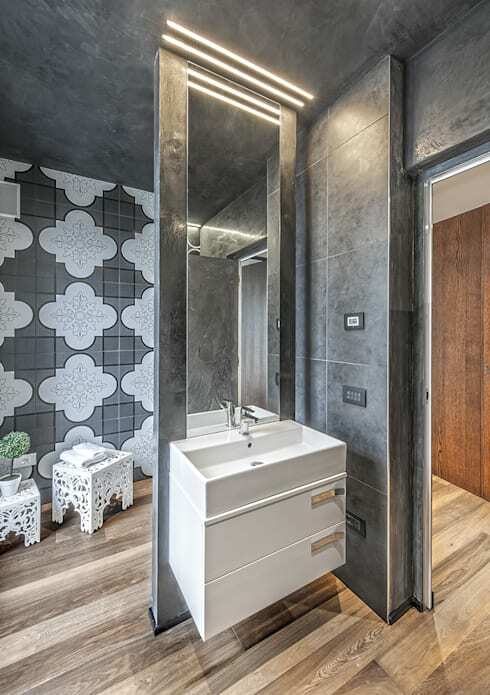 There's nothing better than an artistic bathroom for a house which is smart and not afraid to surprise. The lime green colour used for the main walls instills a sense of vitality, with sharp decorations and a verdant plant placed in the corner. 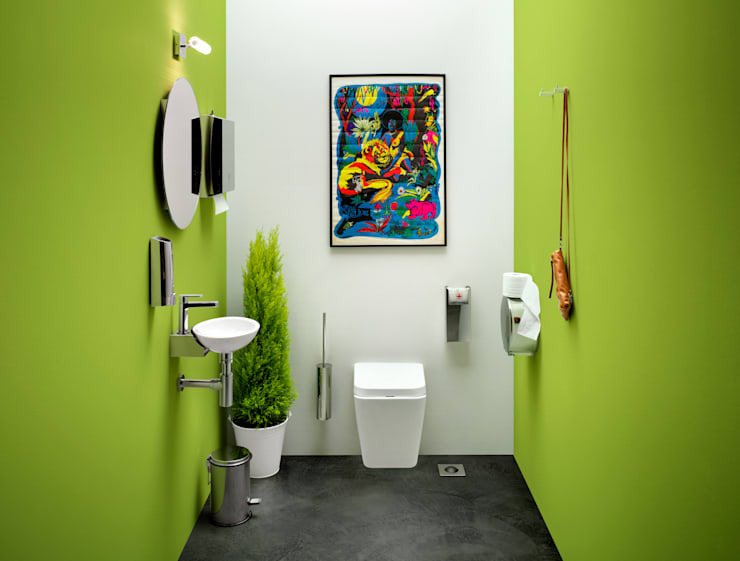 Variations in hue and bold design characterise the next bathroom, which is small but absolutely revolutionary. With a rectangular plan, the space has a distinctive appeal with its striking colours and furniture design. Elegance without end in black & white; this modern monochrome design is the height of sophistication and seriously practical to boot. Located in a delightful French apartment, it makes a inspiring template to copy. White tiles everywhere, a double sink and small cabinet combine gracefully with cascading lamps and diminutive green plants. 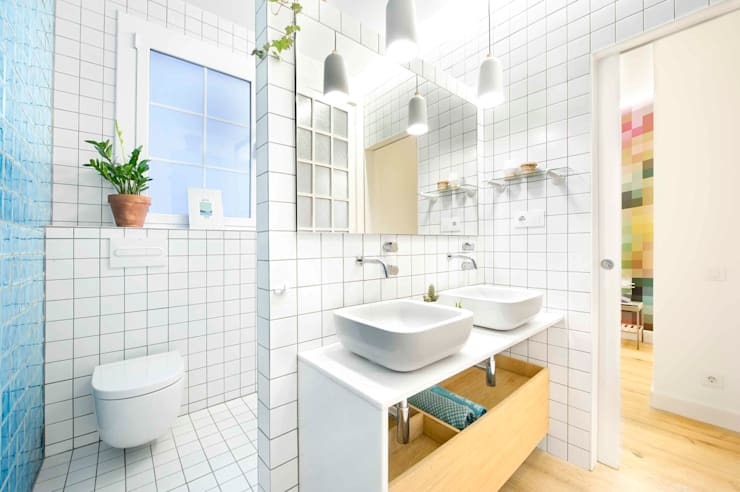 All in all, a charming and bright room in typical Nordic style that makes its compactness an undisputed strength! 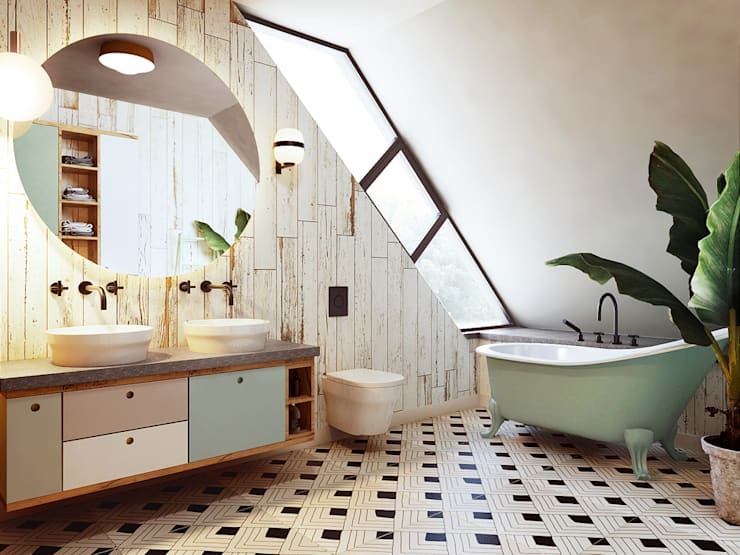 For more spectacular bathroom designs, take a look at: 5 soothing bathrooms you'll wish were yours. How could you make your bathroom more spicy?